Classically Liberal: When no rational reason can be found, look for an irrational one. When no rational reason can be found, look for an irrational one. It seems to be true, that anytime you can't find a rational explanation for the way someone behaves, look for an irrational one. And that usually means religion. A case in point was the recent death of Congressman John Murtha. 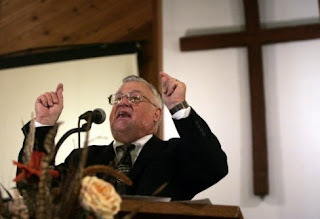 Southern Baptist minister Wiley Drake suggested to his congregation, in an email, "Maybe God took him (Murtha) out. Maybe God answered our imprecatory prayer that we prayed every 30 days." Apparently Drake and his congregation put Murtha on a divine hit-list. They would ask God to kill people and in their prayers would name who they wanted the God Father to bump off. Before you think that some supernatural assassin was at work, remember that Murtha was 77 years old. Really now, that sort of "prayer" was bound to be answered eventually. These days miracles have a very low threshold, nothing like parting the Red Sea, or raising Lazarus from the dead. God, apparently in his old age, has grown feeble and now resorts to striking down old people. One good loud "boo" in the dark probably would have done it. Wiley "God is Love" Drake previously prayed that his deity would kill President Obama. He stopped doing that, not because he doesn't want the Secret Service arresting God for murder, but because he wants Obama to stand trial for not being born in the United States but serving as president anyway. Alas, scratch a nut and you find a variety of lunacies. Rarely are the insane just crazy about one thing. And often real fringe crazies change obsessions the way Paris embraces a new fashion. One week they're a Truther, the next a Birther, then a Bircher. Apparently Rev. Flake has a history of being insane in the name of Jesus. Not-s0-Wiley said he could see the logic in Pat Robertson's claim that a pact with the Devil is the reason Haiti had its earthquake. Flake said that the pact with the Devil was set to expire in 2004. Imagine that: Satan puts a use-by date on his pacts. How considerate! Faced with expiration Haiti renewed the contract in 2004 but the renewal never took place. Apparently God sent the quake to smite the Haitans AFTER they let a pact with the Devil expire?? Rev. Put-Me-in-a-Straightjacket said: The pact may not be there, but the results of it may be." Rev. My-Medication-is-Wearing-Off was a plaintiff in a lawsuit claiming Obama wasn't a U.S. citizen. He also served as "chaplain" to the campaign of the Jim Gilchrist, the founder of the anti-immigrant Minutemen. He used his church to endorse the campaign of fundamentalist nutter Mike Huckabee, and when Americans United for Separation of Church and State filed a complaint with the IRS, since tax-exemptions means non-partisan, he put AUSCS on his divine-hit list as well. It might be easier for the good reverend to just remind God of those people who shouldn't be bumped off. If you think he's just fringe remember that Rev. God-is-Hate was the vice president of the Southern Baptist convention—which makes me wonder how insane you need to be to qualify as president? posted by blog owner at 2/12/2010 05:30:00 AM DiggIt! Reddit Del.icio.us Slashdot It!